Many, if not all, reading this have been to an exhibition of art at a commercial gallery. Commercial galleries offer their space to a procession of artists throughout the year in order to exhibit those artists’ works. The ‘voice’ of a gallery is the choice of a gallery. Gallerists - gallery owners - work with artists whose art they feel is resonant with the cultural zeitgeist of the moment; whose art reflects something about the today that they believe is important to share with others. Commercial Gallerists hope that visitors - their potential customers - will discover their own reflexive-insights within the gallery’s voice and the artists’ visions, and choose to show that support through purchasing artworks. This allows the galleries and artists to continue producing works as well as allowing a gallery’s customers the ability to live and grow with the artist’s vision in their own home. When visiting a gallery, everything is ordered in such a way as to (hopefully) make it appear as though this temporary moment has been/is/will be permanent. It is rare as a visitor to an exhibition to be aware of the penumbra of activity surrounding that permanence. How often do we encounter what happens before and after a show, when the walls are bare and pockmarked with spackle? Puppy present at the opening, but not part of overall exhibition. It was just too cute a shot not to use. On June 1st, I caught myself idling down North 2nd street in Northern Liberties. It was First Friday and I wanted to return to a neighborhood I had not visited in a couple of months to see what work was being exhibited. I ambled past Gravy Gallery, paused, then slowly walked backwards to take note of another world inside the gallery which had caught my eye. 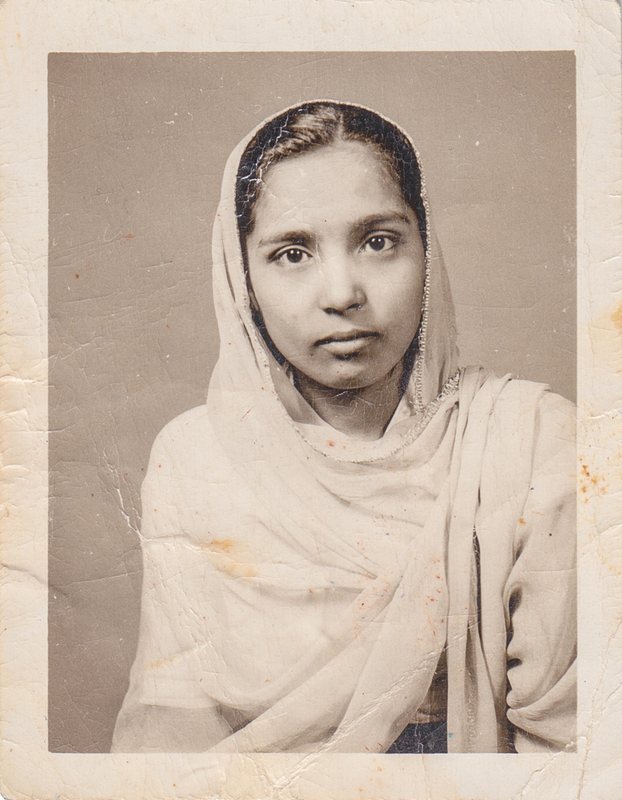 Saleem Ahmed, journalist and photographer, had put together an exhibition of photography focused on women in his family who were raised in Udaipur, India. These photographs are collected in his photo-book, Rani Road. However, photographs were not the only things that occupied the space. They were accompanied by objects distinctly quotidian such as tables, fabrics, family photos, food and drink, arising out of his family’s culture. Their installation was complex and full, which transported the photographs, and the experience of viewing them, into another space. Besides enjoyment, my first thoughts about the art was that the photographs were intimate, without being idiosyncratic, as well as formally rich. It’s not easy to make photographs or you family interesting to people outside of your family. Any of us who have had to ‘coo’ in the break room over a co-workers photographs from their recent family trip may be aware of this phenomenon. However, the elaborateness of the installation made me think about how much effort Saleem must have put into gathering these elements together, and forced me to wonder what would happen to them, as well as the art, after the show. The thought traveled with me for the rest of the evening and into the next week where I was so bothered by it that I had to reach out. After e-mails back and forth with Katie Tackman, one of the co-curators of Gravy Gallery, and Saleem, we set a date to meet and discuss just this topic. Saleem explained that his experience with putting the show together began by being contacted by Katie. 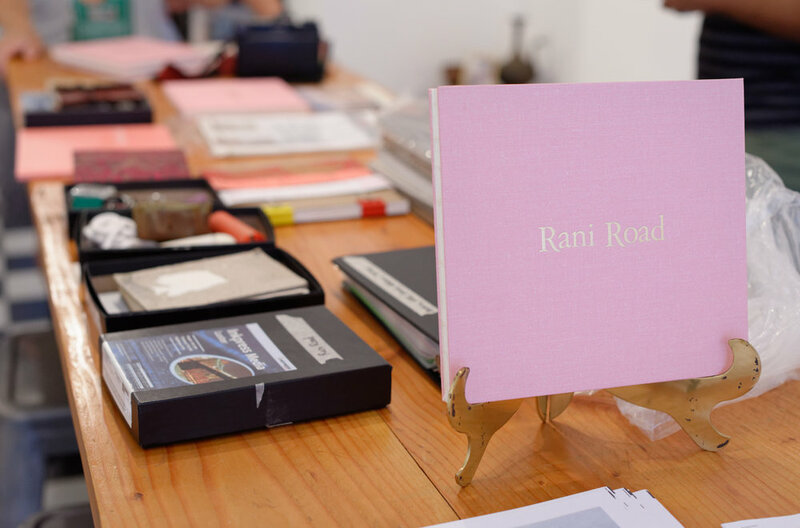 Gravy has a revolving curatorial schedule, with different operating members curating exhibitions, and Katie wanted Saleem to put together a show based upon his photo book, Rani Road. She e-mailed him images of previous installations and over the intervening months they agreed on timing and the basic logistics of exhibiting the work. Like many exhibitions - and life for that matter - I would go on to learn that the preparation for putting together this exhibition was painstaking and deliberative, while the takedown was quite quick. Katie and Saleem worked together for several months, sharing ideas back-and-forth about how to transform the space and find the balance between setting and focus. Putting together an exhibition such as this is almost a little bit like being the designer of a theatrical production. There is a stage that acts as setting - the gallery. There is a duration of experience - though unique to each visiting individual. And there will be, by dint of not being able to experience everything all at once, a sense of periodicity in exploring the world that the artist has created as you travel around the space. These assertions may seem a little over-the-top, but as someone who spends a lot of his free time traveling around Philadelphia to experience art, I feel like I have the authority to say that this exhibition caught my eye because each of these three aspects of visitor experience were dealt with directly and in-depth. Katie and Saleem detailed for me the emotional hand-wringing, organizational propriety and creative reworking that went on for several months in order to make the moment I walked through the door appear effortless. The show was up for a month, during which time the reasonably priced and incredibly engaging photographs did not sell. However, a handful of copies of Saleem’s book did find new homes in which to unravel their visual story and offer up moments of reflection for their owners. Saleem informed me that the photo world is “book-crazy” right now, which I thought made a lot of sense. Much is being said about those who have discretionary income being more inclined to spend it on experiences than objects. In a world where we are rapidly forgetting that viewing is an experience unto itself, it makes sense to me that a book - even though a centuries old format - would be more attractive to a contemporary buyer of art as it explicitly requires their interaction to unfold itself. An image from Saleem’s artist talk about his book Rani Road. All good things must come to an end, and that nagging thought that had driven me to reach out to Katie and Saleem now wanted me to inquire where all these complex parts of the exhibition now lived. Saleem informed me that several of the photographs in the exhibition had been re-hung in his own home, in intimate spaces such as his bedroom and living room. However, the majority had been taken out of their frames and stored safely from light, dust, scratches and so many simple environmental factors that can ruin expensive prints. The frames are now neatly stored in his basement closet. The small rug, end table, incense holder and textiles in which the gallery was swathed, now furnish parts of his own, recently purchased, home. I found it particularly poignant that these two big life moments - a solo gallery exhibition and the purchase of a home - coincided so closely with one another and that the needs of one (furnishing a home) became so important to the other (contextualizing artwork). Saleem is now half-living in the world he helped create for his artworks and the visitors he wanted to explore them. By the time you are reading this, several more exhibits have come and gone at Gravy. I imagine their stories are similar, but different. Familiar, but at a distance, to Saleem’s experience. Galleries like Gravy and curators like Katie who choose to work closely with artists in order to divine a shared vision that they believe elicits something unique and nuanced are becoming more rare in an art world that is trending towards quick and digestible visual experiences. I will not forget their efforts and, in knowing that there is a home in Philadelphia where elements of this installation still exist, am happy to think that such a considered and evocative experience could be reconstituted again.